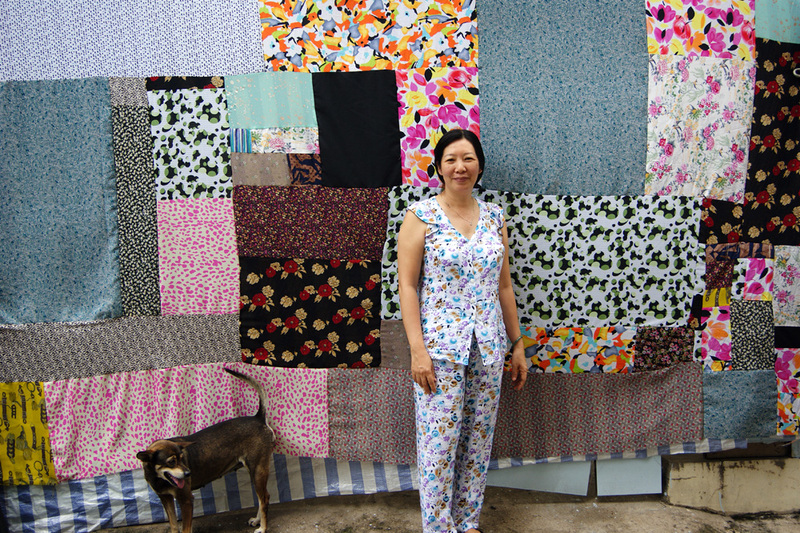 Đồ Bộ is a pajama-like clothing that most likely grew from the traditional "áo bà ba" most Vietnamese women own and wear daily. Far from being clothes to sleep in, these women wear these clothes due to the ease at which they could run back and forth between domestic work and work outside of the house. Working class women, in particular, wear đồ bộ outside of the house as they work in the market or while running small family businesses such as home groceries, food stalls or vendor carts. By transforming used đồ bộ or the most common types of fabric for these clothing, I hope to reframe the seemingly unacknowledged space and work that a vast number of women occupy and examine popular notions of ‘work’, status, class, gender; meanwhile, celebrating people’s resourcefulness in their usage of space. As an on-going work this project has gone through various stages of experimentation. Starting from covering public spaces with large fabric patchworks; to transforming the fabric into soft sculptures that acts like an extension of the outfit which plays with the idea of weight and lightness—valued and under-valued. As of now, the project focuses mainly on pushing the idea of space, or ‘borderless-ness’ by manipulating the fabric or its imagery.